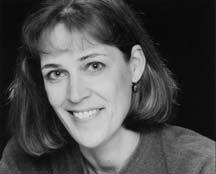 The 2011-2012 Stan and Sandy Rives Award for Excellence in Undergraduate Education has been awarded to Illinois State University Theatre Professor Lori Adams, who acts as head of the Undergraduate Acting Program in ISU's School of Theatre. The Rives award will be presented to Adams at the Founders Day Convocation on Thursday, February 16th, at 2 pm. According to ISU's press release, the Stan and Sandy Rives Award was created to recognize "outstanding teaching or any significant contribution to the undergraduate experience, with special attention given to the first-year experience." That makes it a perfect match for Adams, whose position puts her in charge of more than 150 undergraduate acting majors,. She personally auditions and interviews each incoming acting undergrad, and makes it her mission to stay in touch and guide them through that crucial first year at ISU. It is also part of Adams' responsibility to coach and prepare the student actors who will represent ISU in the Irene Ryan Award competition at the annual American College Theatre Festival. Adams' actors have done very well in the ACTF competition, with ISU's Clayton Joyner named one of two national Irene Ryan champions in 2011, and Owais Ahmed and Abby Vombrack winning at the regional level in Urbana last month, earning the right to advance to the ACTF finals at the Kennedy Center in Washington DC. Aside from her ISU responsibilities, Lori Adams is a very well-regarded director, recently earning "Best Director" honors from St. Louis Post-Dispatch critic Judith Newmark for her work on "Falling" at St. Louis's Mustard Seed Theatre, and a prominent actress, with notable credits in Alan Ayckbourn's "Woman in Mind" and Martin McDonagh's "The Beauty Queen of Lenane" at Heartland Theatre and in "Macbeth" and "Henry VIII" at the Illinois Shakespeare Festival. 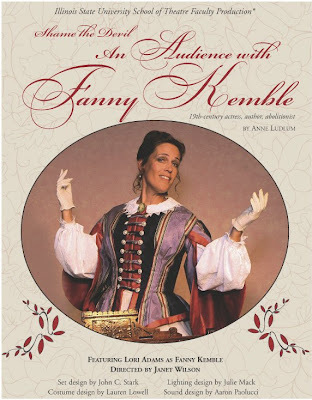 As you can see from the poster above, Adams also starred in "Shame the Devil: An Audience with Fanny Kemble," a one-woman show written by Anne Ludlam that toured extensively around the US and Canada.